My first taste of authentic ramen was during my second trip to Japan in July 2010. In a small, smoky, down stairs restaurant in Harajuku I was served up steaming miso ramen in a large stone bowl. The miso stock was extremely salty, and would have been a nightmare for anyone taking medication for hypertension. Prepared by combining a large amount of miso paste with chicken or fish stock along with pork fat, the result is a thick soup that is then combined with sliced pork, cabbage, bean sprouts, spring onion and a sliced hard boiled egg. In my opinion, ramen is a great comfort food, and like any comfort food, does not rate high in the health stakes. 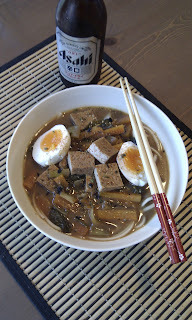 A few days ago I had decided to have a go at making miso ramen myself. Having to make do with what I had on hand, I made the soup by combining chicken stock, red miso paste, dark soy sauce, mirin, garlic and ginger and allowed it simmer until reduced to a thick liquid. In a wok I briefly fried one carrot sliced thin, and two sliced bok choy and transferred this to a bowl along with ramen noodles, firm tofu and a hard boiled egg sliced in half. The soup was poured over and garnished with furikake and shichimi togarashi. The result wasn't exactly authentic, but it was hot, salty, comforting, and a warm reminder of my first authentic ramen experience in Japan.